Situated on a charming piece of St. Simons real estate is Postell Park. For those that have never visited the park before, itâ€™s located right near the St. Simons Casino Building on Beachview Drive. The park features paved rental spaces, green areas, park benches, restrooms and utility hook-ups (i.e. water/electric). It is also the site of many upcoming, free-to-attend events. In early May 2014, the park will host a fabulous Motherâ€™s Day Arts & Crafts Show. It is slated to take place from 10 a.m. until 5 p.m., on the 10th and 11th. At this point, more than 35 vendors are on tap to be there. Among them will be people displaying wildlife photography, sea glass art, South Georgia greenery, sand casting, beach furniture and gourd fairy houses. It isnâ€™t the only Arts & Crafts Show expected to take place at the park either. The same group will be managing events during the 4th of July Sunshine Festival, August End of Summer Weekend, St. Simons Fall Food & Spirit Festival and the December Pier Village Holiday Market. 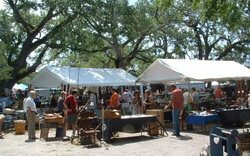 In late May 2014, on Memorial Day Weekend, the park is slated to host an Antique Show. It is expected to run on Saturday and Sunday, from 9 a.m. until 5 p.m. The show is a frequent event at the park and always attracts an amazing number of vendors. So if you miss the May event, donâ€™t worry. Additional shows are scheduled to take place in June, August, October and November. To learn more about Postell Park and the St. Simons real estate properties for sale or rent located near it, please contact us. Weâ€™d also love to show you other beautiful properties that are available throughout our coastal region. Our St. Simons real estate agents are available to meet with you year round.